When a book’s front cover’s got some kind of Asian-inspired sandwich (after research, Thai Barbecue Seitan Ribs with Pickled Thai Basil and Onions and Smoked Chile-Roasted Peanuts… whew), and its back cover’s just a grid of donuts, you know it’s going to be a good one. 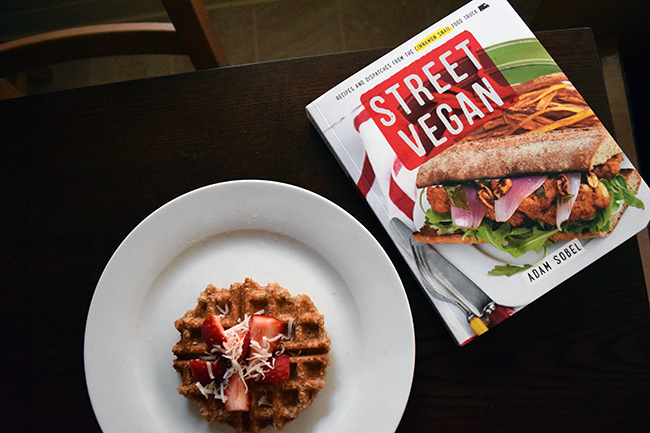 Street Vegan delivers, with an abundance of flavorful recipes, hold the animal products. Vegan donuts are an entire chapter, so, you know, there’s that. The book is enthusiastically and earnestly written, with stories from Sobel’s Cinnamon Snail food truck adventures. He says, before inventorying his own vegan pantry for the reader, “Just going vegan today? Yay! I am out buying you balloons right now and getting ready to shower you with a bucket of confetti!” I don’t think there is a trace of irony in this. He’s just that excited about it. And, I mean, really, there’s a decent amount to be excited about. 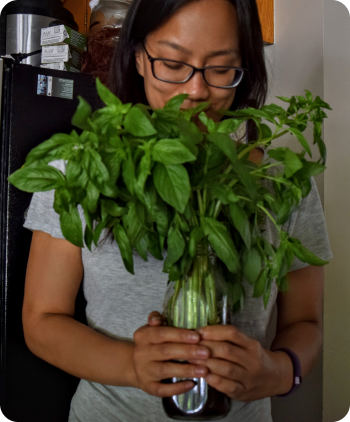 I tried out two recipes and read through many more, and they were thoughtful, creative, and flavorful dishes. He recognizes the importance of condiments and sauces when you can’t rely on meat or dairy flavors, and many (maybe even most) recipes have “bonus” additional recipes — one for the main item, and more for toppings. This presents some exciting mix-and-match opportunities, which I like, as a person who can never exactly follow recipes. I gravitated toward the more Asian-inspired dishes, but the recipes take cues from all over the world, which I like. Mo flava, mo betta? Okay, but onto the food. 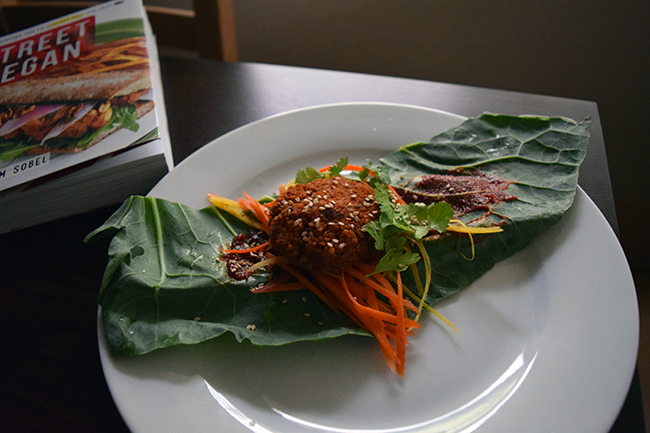 I made the actual burger from Gochujang Buger Deluxe (first picture above) and had it with a quickie version of Street Vegan‘s pickled vegetables, in a collard green wrap. In the book, it’s served on burger buns toasted withs sesame oil (nice!) and topped with both gochujang, kimchi, and Sriracha mayo. Whoa. It was a weekday, so I lightened it up a little. The burger was easy to make and bold in flavor, which I liked. I found it to be slightly salty but otherwise great — a cinch to pulse together in a food processor and then form into patties, and moist without being sloppy. It’s seitan-based, which is an ingredient I rarely work with, but I thought they were good and satisfying. The book has a recipe for homemade gochujang, which I’m looking forward to trying, later… maybe when I use up the big tub of it in my refrigerator. I also tried the Cashew Oat Waffles from the book’s Breakfast section, though I had a small one as a dessert. The oat-and-cashew-based waffles were pleasantly hearty, lightly sweet from agave nectar, and smelled amazing in the waffle iron. I think they’d make a respectable breakfast and are easy to pull together, though the batter does require a 20-minute resting period. He serves them with caramelized apples and syrup, but I went with strawberries and coconut, mainly because that’s what I had on hand. I will say that a number of the recipes require tools like a food processor, and some a dehydrator. The ingredients are not terribly exotic for someone who regularly cooks, especially with an international influence, but it might be a challenging book for a new cook or for someone whose cooking style isn’t close to Street Vegan‘s already. Overall, I think this is a solid book with a number of vegan recipes with lots of creative flavor and texture combinations. You could see how the recipes would be good in a food truck setting — they sort of put it all out there. “Restrained” is not a word I’d use to describe this book or its recipes, but that’s not necessarily a bad thing. I’m glad to see a book out there that’s embracing the wide world of flavors outside of animal products and think it’s a good reminder of those possibilities for vegan and non-vegan cooks alike.